You could settle for a desk like everyone else has in their home office or you could dare to be different and have Superior Closets design and build a custom work space for you that will not only serve you on a functional level, but also dovetail seamlessly with your interior design scheme. We can set up custom work spaces for you in any room in the house; we can even fold one discreetly into the kitchen if you’d like. With a custom work space from Superior Closets the only limit is that of your imagination. Here are just some of the options available to you. Tucked Smartly into the Corner – By building your work space into the corner of the room you make use of what is normally empty space. You can take advantage of the converging walls as well to maximize storage and best of all, keep the whole thing very discrete. Make the Most of Unusual Spaces – A lot of old Victorian homes have curved walls along with nooks and crannies that are considered too eclectic and wasteful to most architects today. You can put those idiosyncrasies to work for you by turning them into work spaces that rise and fall with the windows, turn corners and even fit into the triangular space under a staircase. Expand Your Possibilities – By designing your work area with long countertop-like surfaces, you can integrate it more fully into whatever room you place it in. Whether bedroom, kitchen, dining room or living room, you’ll find plenty of extra use. 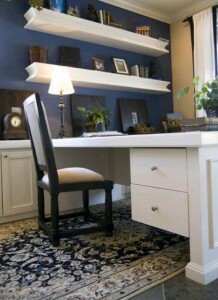 Your work space can even transition from one purpose to another as you move away from the central work area. Don’t Scrimp on the Customization – Your custom work space can have its own lighting scheme, a hidden monitor that reveals itself at the push of a button, a hidden printer that again is only visible when you need it, a built in sound system and whatever else you like. The stand alone desk and chair setup has its place; if you have plenty of room to dedicate to navigating around it all the time. With custom designed and built home work spaces by Superior Closets, you’ll have complete flexibility and make maximum use of the space you do have. Call us today on 905-669-8280 to talk to one of our friendly and knowledgeable staff about having us create a beautiful custom work space for you.